Remember how on Friday I blogged about the Shrimp Stir Fry that I made from America's Test Kitchen? On Friday I tweeted them a link to my blog post, because they like to see photos of the food that their fans make from their shows/recipes. On Monday, they mentioned me on their Twitter feed and I clicked on the link. It was a link to their community blog. 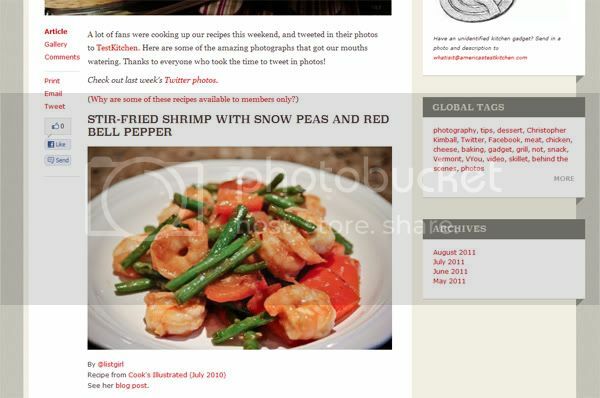 My photo of the Stir-fried Shrimp with Snow Peas and Red Bell Pepper showed up on their blog! This was definitely a first and I was so excited! They linked to my Twitter and my blog post as well. New52 is a project started by Peppermint and I to encourage each other and others around us to try something new every week in 2011. The "new" each week doesn't have to be something big. It could be something as simple as ordering a new dish instead of old standbys at your favorite restaurant. It's simply opening your heart up to NEW possibilities. Don't worry if you're late getting started on joining in. It's totally OK if you miss a week here or there. We encourage everyone to keep an open mind about trying something new. This is a life project, and a photography/blog and even scrap challenge if you wish. If you participate this week, please leave a link to your blog post in the link list below. Before long, everyone in America is going to know ListGirl. I know..why don't YOU run for President?? I think it would be a fine idea to put a finance person in the oval office. Congrats on being featured on ATK, we subscribe to the magazine and love it. Ahhhhhhh, that's so cool Christine!